First in fast-growing Charlotte, NC, then in visits to Greensboro, Raleigh and Indianapolis, I’m noticing what seems to be a new geography. Do you see it, too? 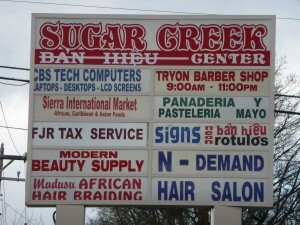 At first glance, one or two suburban boulevards may seem to be a Latino barrio, or perhaps an “international corridor.” That’s because foreign language signs are the first things to catch your eye. But look close and you’ll see many ethnicities plus old-line white and black entrepreneurs, often side-by-side in the same strip shopping plaza. Where to start looking? Find a suburban area that came to popularity with middle-income folks in the 1950s – 1980s, a place of mid-sized single-family homes plus lots and lots of apartment complexes. Not the posh part of town. That’s because rents are too high. Not the worst part, since immigrants, like the rest of us, are looking for the best affordable places they can find to raise families and start businesses. Buford Highway in Atlanta, Lorna Road in Birmingham’s south suburbs, Central Avenue and South Boulevard in Charlotte, Lafayette Road in Indianapolis … there’s usually a business street where you can begin your search. Fan out from there. How far does this new intermingling extend? Salad Bowl Suburbs Global Food Geography in Charlotte, N.C….and beyond. Written for John T. Edge, Elizabeth Engelhart & Ted Ownby, The Larder: Food Studies Methods from the American South (Athens: University of Georgia Press, 2013). As immigration patterns transform neighborhoods outside urban centers, they are also changing what, and with whom, suburbanites eat.